171 p., 18,1 x 25,4 cm. From 1805 to 1820, Bernard Bolzano was professor of »religious doctrine« (Religionslehre) at the University of Prague. The lectures he had to deliver were part of the so-called »Philosophical Studies« that every student of the university had to complete before he entered the »higher« studies, i.e. the studies of medicine, law or theology. As professor of religious doctrine, Bolzano also had the duty to deliver the homilies on Sundays and holidays during the academic year to all the students of the »Philosophical Studies«. 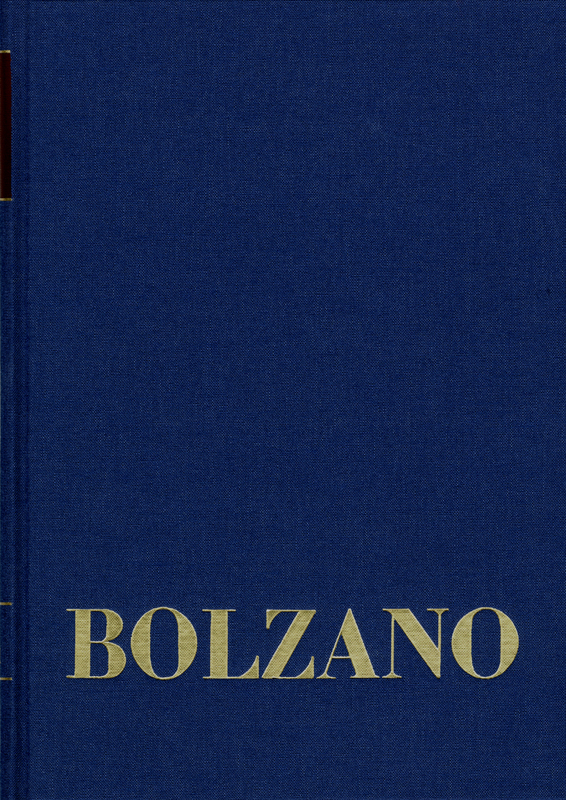 This explains the enormous influence Bolzano exerted through these homilies on the intellectual and political life of Bohemia in his time, whose offshoots reached even the Charta 77 movement in former Czechoslovakia. The chairs of religious doctrine were established by the Austrian emperor Franz at all universities of the Austrian empire in order to shape the students into »good Christians and law-abiding citizens« as it was ordered in a decree. The homilies Bolzano had to deliver at the University of Prague (as did all professors of religious doctrine at Austrian universities) were called ›Erbauungsreden‹ (edifying addresses) or ›exhortations‹. There is evidence for 582 ›Erbauungsreden‹ Bolzano delivered as a professor at the University of Prague of which 414 are extant; of these, 153 have not yet been published at all. The 414 ›Erbauungsreden‹ that are extant have survived in different form: some of them (70) as autographs, i.e. in Bolzano’s own handwriting, others in handwritten copies of Bolzano’s manuscripts, others in notes taken by Bolzano’s students. Several collections of Bolzano’s ›Erbauungsreden‹ have already appeared in print, some of them during Bolzano’s lifetime, while others were published posthumously by his students or other editors. – The new critical edition of Bolzano’s ›Erbauungsreden‹ presents all of them in chronological order. Those which are extant will be edited on the basis of the best version which has remained. Those ›Erbauungsreden‹ which are not extant will be documented and described according to an index Bolzano himself has prepared. The academic year 1812/1813 ended prematurely for Bernard Bolzano. Bolzano’s beloved sister Franziska was dying, and suffering and night watches aggravated his latent lung disease. The doctors recognized the danger to his health and advised him to stop teaching. An ongoing weakness forced him to stop teaching on 23 May 1813 for the rest of that year and the next two years as well. During this time Bolzano was also unable to hold any edification speeches. In the academic year 1812/1813 Bolzano held 34 speeches, four of which were lost. Half of the other 30 speeches are published in this edition for the first time, most of which according to transcripts which were organized under the direction of his student Michael Josef Fesl, who was the praeses of the seminary in Leitmeritz. Bolzano‘s students henceforth increasingly supported the propagation of his edification speeches.